Sakai Community DocumentationSakai 19 User Guide (English) RubricsHow do I add a rubric to an assessment (i.e. test or quiz)? Rubrics may be associated with individual questions on an assessment. 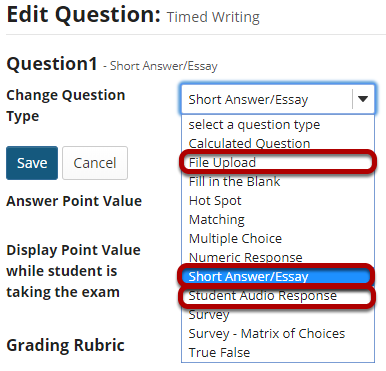 You may add a rubric to any of the instructor-graded question types: File Upload, Short Answer / Essay, or Student Audio Response. Add or Edit an instructor-graded question type in an assessment. 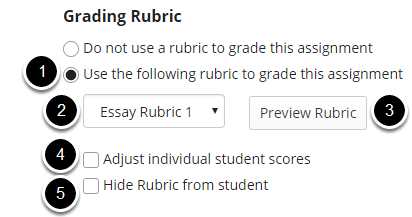 You will see the Grading Rubric options just below the point value information, once you have selected one of the instructor-graded questions types. Select the Use the following rubric to grade this assignment radio button. Choose the desired rubric from the drop-down menu. Note: You must have existing rubrics in your site before they will display in the menu. Shared rubrics must first be copied to your site before they will be available for selection. (Optional) Preview the selected rubric to make sure that it is the correct one. (Optional) Check the box for Adjust individual student scores if you would like to be able to change the number of points awarded for individual criteria ratings while grading student submissions on a per-student basis. (Optional) Check the box for Hide Rubric from student if you do not want students to see the rubric prior to submitting. Select Save when you have finished setting up the question. Your question now has a rubric attached. Questions with rubrics attached display a rubric icon next to the points for the question. Prev: How do I add a rubric to a forum topic? Next: How do I add a rubric to a gradebook item?